Texas State Flag - 3' x 5' - .. Outdoor Nylon US State Flag?U.S. 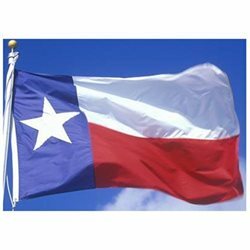 Flag Store's Texas State Flag is printed in America on Nylon flag fabric. Since this flag is made in America, U.S. Flag Store is able to ensure that the complex State emblems are printed with accuracy, sharp detail and bright colors. This outdoor Texas State Flag is finished with the same high quality materials as all of U.S.